So your bathroom’s a little cramped, and you’re thinking of a small renovation project – maybe something to widen the space. You can always take down a wall to make your bathroom bigger, but this isn’t always an option. If you’re looking for great ideas for your Denver bathroom remodeling project that don’t require major demolition, these quick tips for making your bathroom less cramped are for you. Add or expand natural lighting options: If your bathroom has windows, opting for larger ones can easily widen the space. Larger windows allow for brighter natural light, which helps to make the room feel larger, and also makes it seem cleaner as well. The added fresh air and light make for a much more inviting and open space. Opt for larger mirrors: Large mirrors have the same effect large windows do. They affect the way light works in the room, as well as give it a feeling of being larger than it actually is. Large mirrors can make smaller rooms feel less claustrophobic. Avoid Large Fixtures: When space is at a premium, taking up more of it generally isn’t a great idea. By switching to wall-mounted sinks instead of bathroom vanities, and showers instead of tubs, you can free up more space in your bathroom. Sometimes just a little more elbow room can make a huge difference. 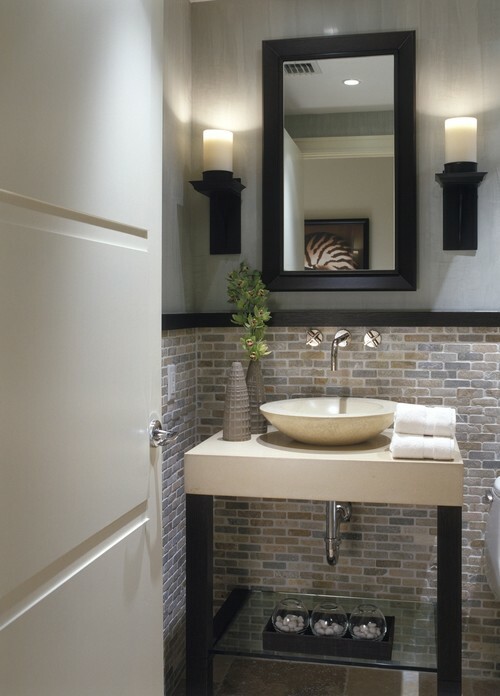 No matter what you plan to do with your Denver bathroom, we can get your project done in as little as one week. We stand by our name, and our expert designers and contractors are here to help you get the bathroom (or kitchen) of your dreams, and all in less than a month. Contact us today to get started on your new renovation project. Contemporary Powder Room by Miami Interior Designers & Decorators DWD, Inc.